The Nightmare never ends! Tim Burton's The Nightmare Before Christmas features a gruesome cast of characters, and that cast expands this holiday season in the Nightmare Before Christmas Select action figure line! Your favorite characters are in your way in Series 4, including Pajama Jack, Zero, and Behemoth with Corpse Boy, each sculpted in an approximately 7-inch scale with character-appropriate articulation. 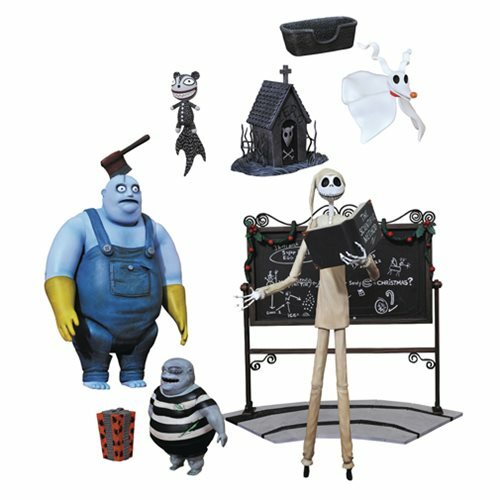 Plus, each figure set includes an exclusive figure or diorama piece - Pajama Jack comes with his blackboard, Behemoth and Corpse Boy come with part of the town square diorama, and Zero comes with part of the central fountain! Connect the Behemoth and Zero bases with other releases to make a larger diorama!